Over the past few months, we’ve had the chance to talk to businesses all over the country and hear stories of how they’ve become successful. For many, it’s pretty simple: the Internet. The web is helping businesses and communities across the U.S. to grow and succeed. 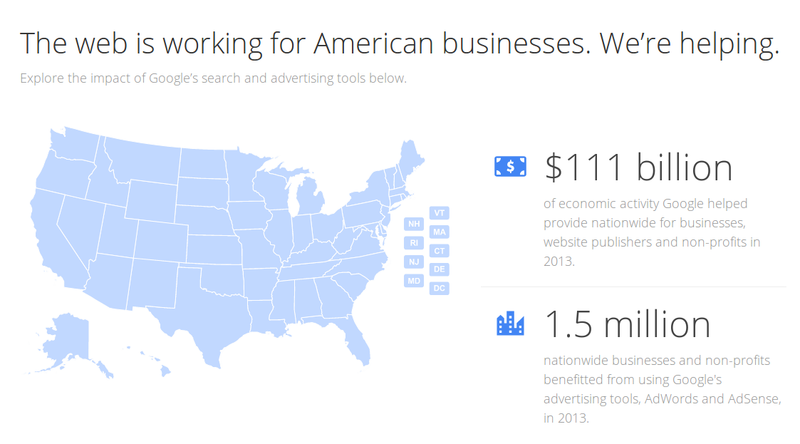 In fact, last year Google’s search and advertising tools helped provide $111 billion of economic activity for more than 1.5 million businesses—advertisers, publishers and nonprofits—across the U.S.
Take Go2marine, a boat supply company located on Bainbridge Island, off the coast of Washington State. Because of their remote location, bringing traffic to their website using Google AdWords plays an important role in their ability to sell their 250,000+ boat supplies to customers in 176 countries. When it’s winter in the U.S., they rely on customers located in other parts of the world where it’s boating season, with the web bringing them business from any place, in any season. Or meet Don Morton, who taught reading, writing and language in lower-income neighborhoods in my home town of Chicago for nine years. In 2005, he began creating his own materials to supplement what the school system provided. Realizing that his worksheets could be useful for students and teachers everywhere, he created ereadingworksheets.com to provide his worksheets for free. Don started using Google AdSense to offset his costs by placing ads next to his content, and today he’s able to work full-time on his website and make an impact on students around the world. These are just two examples of enterprising people making the most of Google tools to find new customers, connect with existing ones and grow their businesses; you can find plenty more of them in our Economic Impact Report. Our tools help connect business owners to their customers, whether they’re around the corner or across the world from each other. And when businesses flourish, it’s good news for the rest of us. Recent data shows that businesses that are online are expected to grow 40 percent faster and hire twice as many workers as businesses that aren’t. Every year, it gets clearer that the web helps lead to more successful businesses, stronger economies, more vibrant towns, and more prosperous communities. Cross-posted with the Official Google Blog.